Hello, sorry it's been more than a day or 2 but if you knew me, you'd know I'm not the most punctual of people : ] , but I do deliver, even if a bit late! 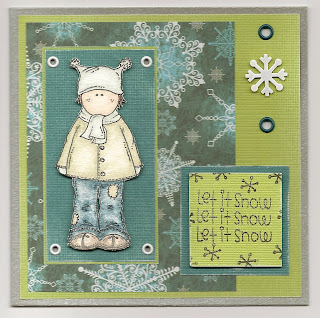 Here's a non-christmas card using another of the adorable sugar nellie stamps, from Funky Kits. They will be adding more to the range next week plus a new range called Maggie, I can't wait!! Not much added to this card as I let the papers do the work plus the fancy fold of the card. I don't know what you'd call it, but the stripey bit opens to the right, then the dotty panel opens to the left and then finally it opens up again to the right! yellow metal tab attached with brad to keep card shut. 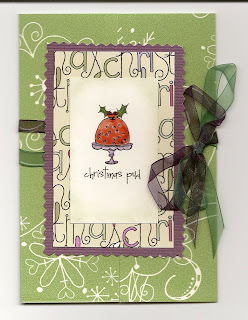 One I made tonight is a christmas card from my new batch of Magnolia stamps, I love them sooo much. 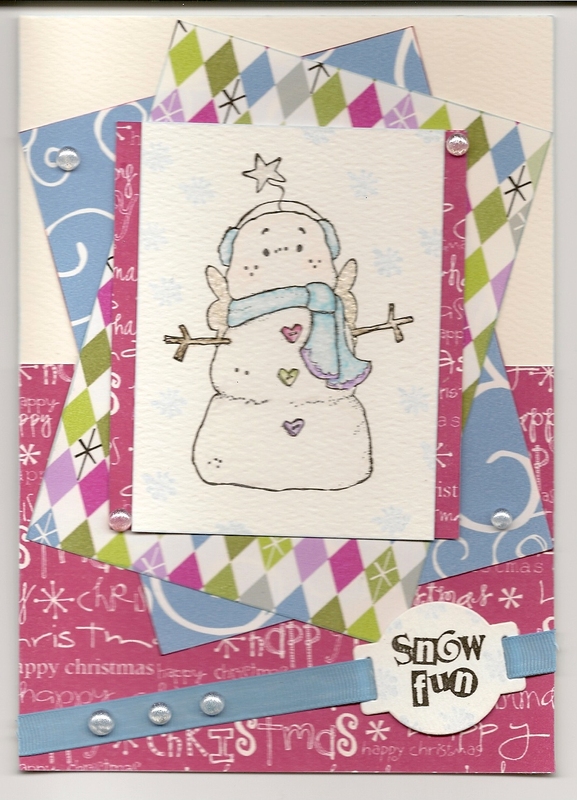 This one is Edwin's snowman and have kept him fairly simple and added colour using some of the gorgeous papers from Pink Petticoat. My snowman came direct from Sweden but I think Funky Kits has him in stock at the moment with some other new stuff, but I'd hurry if you wanted some as magnolias seem to be very hot at the moment! it doesn't look very different in the photo but in real life it has opened up the room more. You'll have to excuse the mess, as it still needs a proper tidy . However, that may have to wait as I just got some more lovely Tilda's through the post today and I'm itching to go play with them . . . look . . . .
See how restrained I am, that I've taken the time to do this first before I go play ;) Hopefully will have something to show you all in the next day or 2. Until then, here's the only card I've managed to make since my last post and yes, it's tilda again, sorry! Will try and do something different sometime honest! Right, this really is the last card tonight (although technically it is a new day now !) and as promised it's Nellies turn. 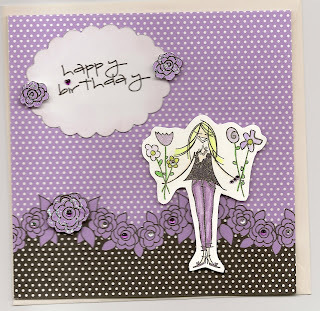 Same colour scheme as my last card just different layout and embellishements. Too tired to list the materials but you get the gist, off to bed now, nighty night! 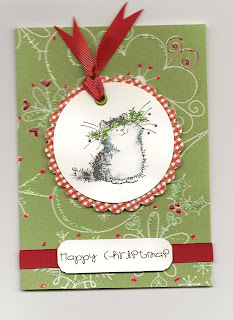 O.K, here's the final card for tonight and it's one from Magnolia's Christmas range which I absolutely love. I coloured her in first so ended up having to find bits to match her which probably wasn't the best way to go about it but it was fun, hope you like it! Also, have had my first comment tonight, woohoo!! However, no name, so whoever you are thank you sooo much, it means a lot. 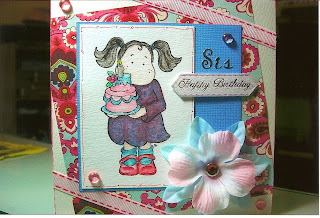 Managed to make 2 more cards with my gorgeous new Sugar Nellie stamps. Images were watercoloured, cut out and stuck on with foam pads. 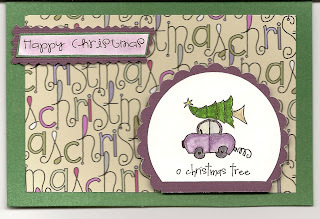 Backing paper is from Dovecraft christmas paper pack. 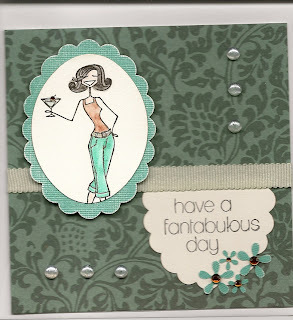 Also used cuttlebug embossing folder on the 2nd card. Trying to split my time between Nellies and Magnolias at the moment as am loving colouring in, find it so relaxing (funnily enough, it was my favourite passtime as a child!). So hope you all don't get bored. May try and fit in some other styles of card but I do tend to go through phases of using certain things or it just could be because I've got so much 'stuff' I don't get round to using them all! 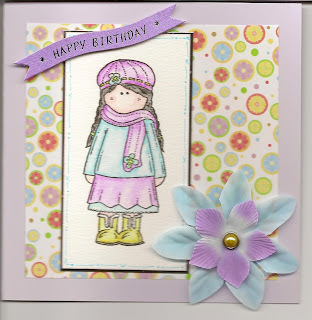 Here she is, my first Sugar Nellie card. Didn't have much time so fairly simple. 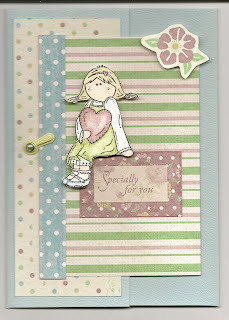 Backing paper is from DCWV summer stack, flowers are papermania ones but I really need to get myself some prima ones. The centre of the flower is a papermania pearl brad. 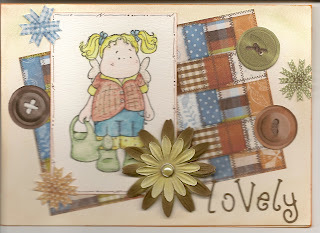 Off to play with my other Nellie stamps now and hopefully share some more cards with you all soon. Managed to make another 2 cards with my new Magnolia stamps, 1 was for my sister's birthday and the other 1 is just a general one. Both just watercoloured and embellished with some co-ordinating backing paper and flowers with a pearl brad in the center. Should really start cracking with the old christmas cards but there's just so many non christmas Tilda's that are calling out to me! 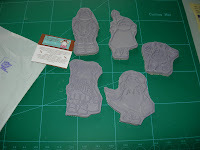 Not to mention I have the new Sugar Nellie stamps vying for my attention now! Hope you are all enjoying my cards would love to hear from anyone out there and hope I'm not just typing/talking to myself :( Although I have to say starting this blog has spurred me on in completing cards as I tend to leave them half finished and it can take me days to finish 1 whereas now I feel like I need to complete them and share them with you all! I got snowbunnybella a few weeks ago and stamped her out but have only got round to colouring her in last night and I was kinda on a roll so kept going and made a card - what do you think? The photo hasn't turned out too well as the card is a lovely pale lilac and all the brown bits of fur on bella sparkles as it's watercoloured with my sakura stardust pens (the lilac card base is from pink petticoat's doodlicious xmas collection printed direct onto white hammered card which I can do now I have my new HP printer - wahey, love it as it's sooo much quicker than my old printer). 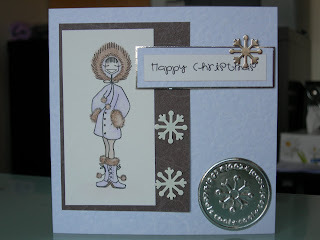 The circle is from cuttlebug xmas jelly folder embossed onto silver card and the snowflakes are brads from docraft which I have had for ages. I'm on a roll here so I thought I'd load some more cards. These are ones I made over the last few weeks. 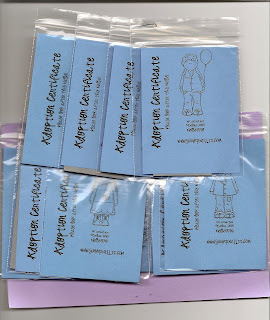 I don't know about you but my cardmaking is a bit like buses, either none for ages or else 3 or 4 in a row all at once!! 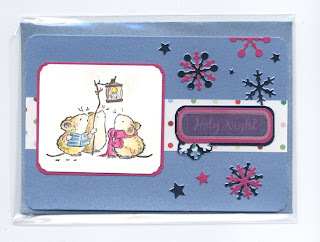 Top 2 cards: Images from Penny Black 'Christmas Critters' clear set watercoloured in pencils with touch of sakura stardust pens (you may notice this is my method of choice for most of my colouring in). Snowflakes are diecut from cuttlebug die and sentiment is from vellum sticker on mice card, Pink petticoat papers and sentiment for the holly card cat which was punched out with woodware superduper scallop circle. 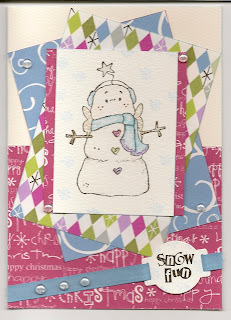 The last 3 cards are all from Pink petticoat downloads either doodlechristmas set or Lola's boudoir set. I love these so much I've even gone and upgraded my printer so that it prints better and quicker for me and also cos I wanted to print directly onto thicker card which my old printer couldn't cope with! Well, it looks like I've managed to post my photos o.k so hopefully I'm up and running now! It's my day off today & weather outside it wet, grey & miserable so thought it ideal to stay in and make some cards. Should really be making christmas cards but I just seem to have soo much stuff I don't know where to start. Does anyone else have "too much stash" syndrome ? Would hate to think it was just me and the worst of it is there's still so much I want/need!!! I'm currently waiting for some magnolia babies to arrive. Got some coming from Silly Monkey but have also been brave and ordered direct from Magnolia, let's hope they arrive as I know many people have had problems. 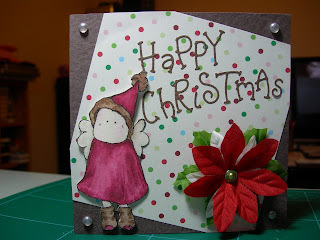 In the meantime I have a few I received from Funky kits and have made upmy first Tilda card. Sorry the photo is a bit blured but it's because it's a scanned picture and because my little tilda is decoupaged and raised it's not sitting flat on the glass. It's my first attempt at trying a more collagy look and probably need more practice but I think it's turned out o.k. 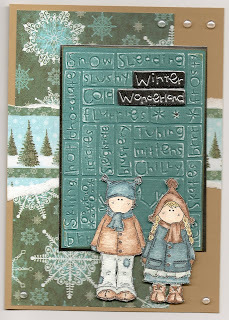 Used: Tilda in welly stamp watercoloured with pencils and sakura stardust pens. Frame cut from sizzix original jelly frame which was then embossed using cuttlebug swirls folder. Backing paper from DCWV summer mat stack and finally paper flowers added with pearl brads. Only discovered these gorgeous stamps a couple of months ago but have managed to amass around 20 of them already but haven't got round to using them all yet. However, here are some of the ones that have got my attention. All pretty simple in style as I think it suits the style of the bellas, hope you agree. Have been playing with some of my new toys and made a few cards. So will now attempt to upload my first card, hope it works! Used: Woodware superduper scallop punch & water coloured in using sakura stardust pens. Cardblank from netto of all places! (pack of 20 assorted only £2.99). Bella's baubles & self adhesive gems for punched out flower centres and the olive in the drink!